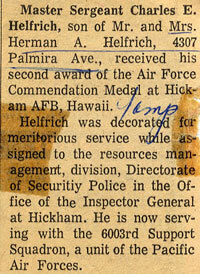 I was born June 25, 1932 in Washington, DC, and my parents were Herman Andrew Helfrich (M/Sgt. U. S. Army Retired) and Mary Elizabeth McCoy Helfrich. 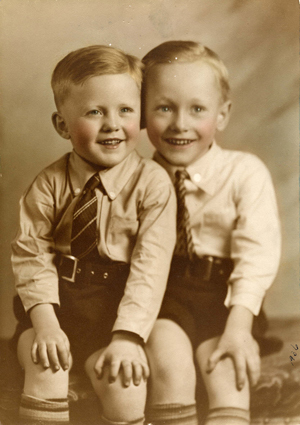 This picture of me to the left was taken when I was only a few months old in 1932. 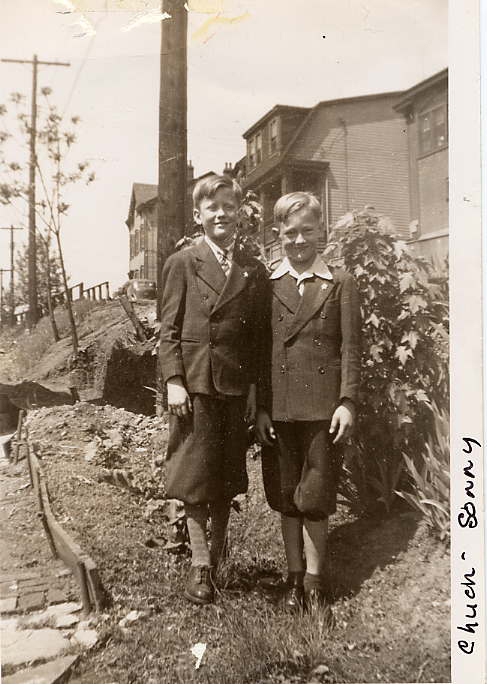 We spent our early years in Pittsburgh, PA. Those were some tough days with the depression, but we survived. However, we had cousins to spend time with in Pittsburgh, PA (my dad's home) and the summers in Tazewell, VA (my mother's home), and we were all close throughout the years. We all were just innocent victims of deprivation. Click on any of these pictures to see a larger version, including the two below. I am on the left in both pictures below, with my brother. 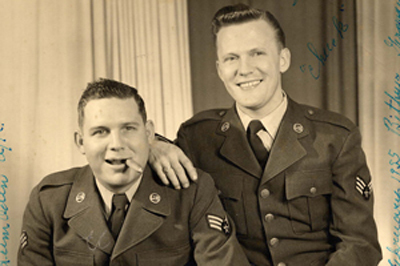 This is Sonny and me - I am on the left. 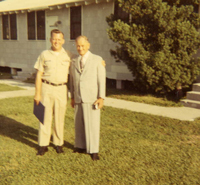 Sonny and I spent a lot of summers on our mother's family farm in Tazewell, VA. There were a lot of cousins there too and we enjoyed those summers immensely. 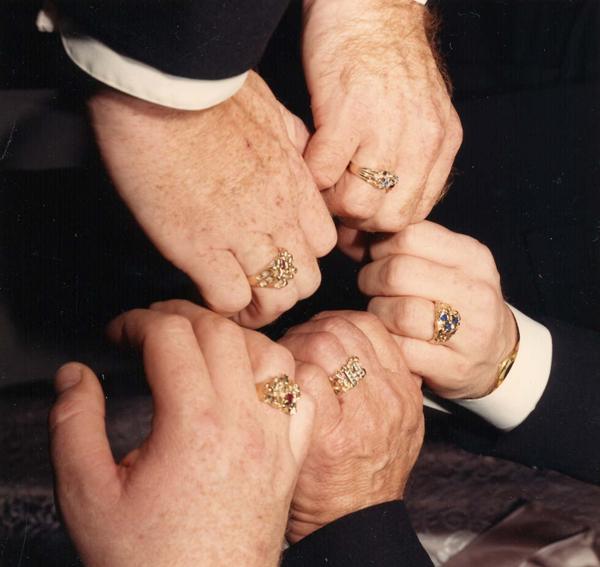 The picture to the right of the four of us is Sonny and me with two of those cousins, Richard and Bobby. 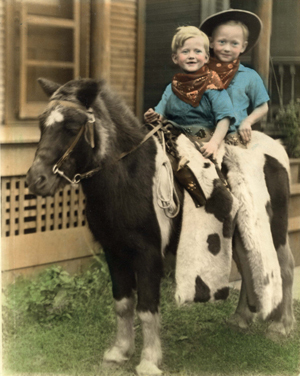 One particular memory on the farm was when a bunch of us young kids went out to milk the cow and we had no idea what we were doing. Obviously, we did something wrong, because we really got into trouble for that one. However, if you look at this picture to the left here, don't we look like angels? 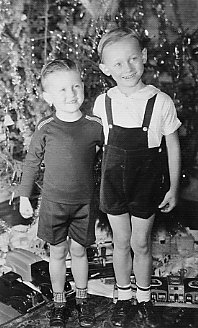 I am on the left, and those knee high pants were the rage at that time in our history. As I said, the country for kids is a marvelous place and time. 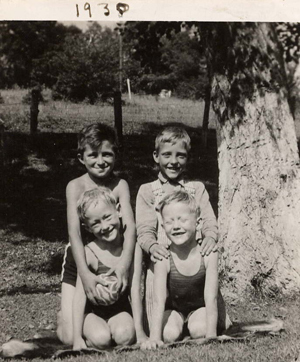 Here is a picture to the right of Sonny and me with two of those cousins we grew up with; Jimmy on the left and Betty Jean Helmandollar beside him. 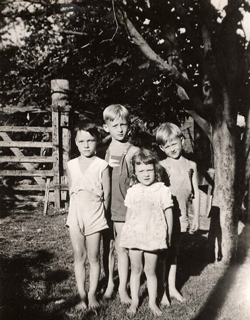 They were the children of mother's sister, June. 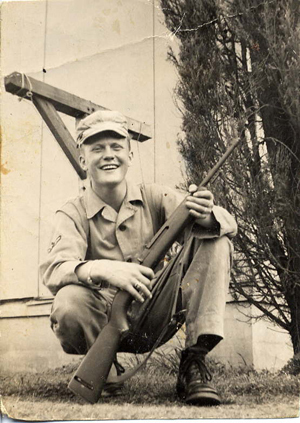 We were all heartbroken when Jimmy was killed in Korea, in 1951. 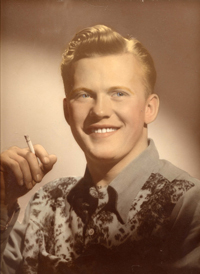 There is a picture of Jimmy's headstone on the military cemetery on this web site, along with certificate for winning the Purple heart. Sonny and I went to Mt. Troy Elementary School in Mt. Troy, PA, which is a suburb of Pittsburgh. 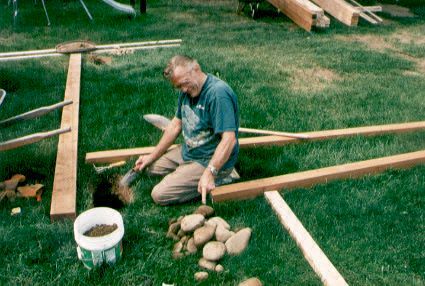 One memory (my misfortune -and not necessarily a pleasant memory) was to get a teacher (Mrs. Ross) who had also taught my brother and our dad. Mother, Sonny and I went as some of the first dependents to Germany, immediately upon the conclusion of WW II, where our dad was stationed at Giessen. The devastation of the war was sad to see. My brother and I both attended school in Frankfort, Germany. We both learned enough German to be able to converse with the German population. 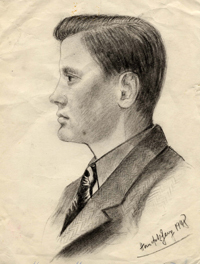 This is a charcoal profile that was done of me by a German artist in Giessen, Germany in 1948. 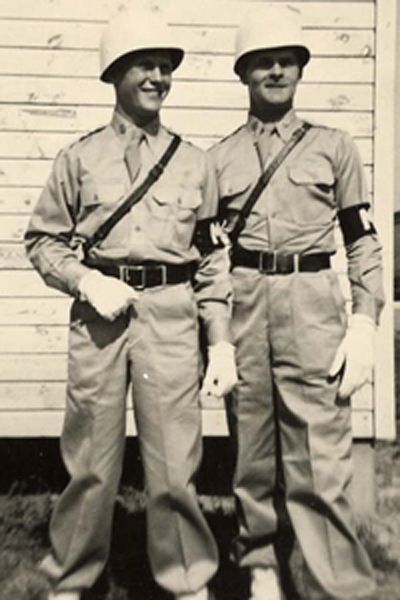 Later, when I returned to Germany in the military myself, it came in handy, being able to speak the language, even though it was not fluently. 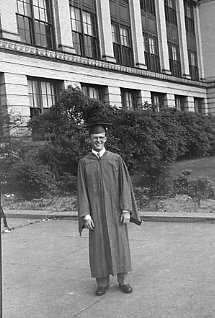 After returning to the United States, I continued my education, first at Latimer Jr. High and then at Taylor Allderdice High School, in Pittsburgh, PA. While in school, I played the clarinet in the band, was on the basketball team, was a member of the German Club and sang as a tenor in the high school choir. 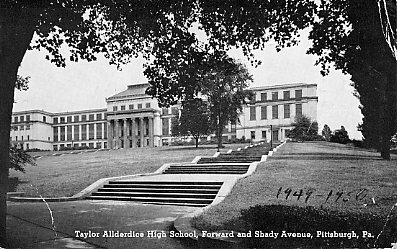 The pictures to the right are of Taylor Allderdice High School, (click to enlarge) with the first one being an aerial view of the school. I worked part time in a bowling alley during high school, with the fun job of picking up the pins and lining them back up, before the new age of machines took over that task. The picture on the left was my senior picture from Taylor Allderdice High School. I think I might just look a little German. What do you think? Be sure to click on the pictures to get a good view. 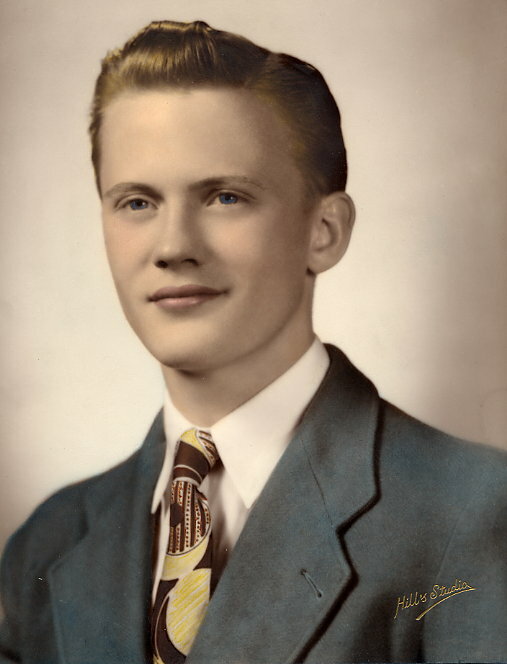 I have actually had several people tell me that I looked like a young Kirk Douglas. 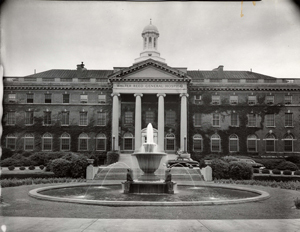 The picture to the right was later in 1950, and Jackie always liked that one, so we added it to the page. 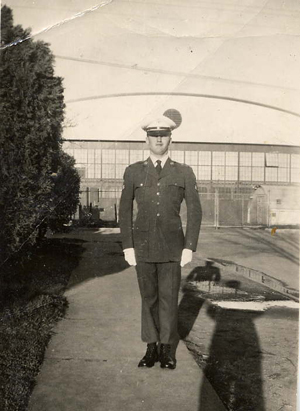 I graduated, and on June 25, 1950, on my 18th birthday, the Korean Conflict began. 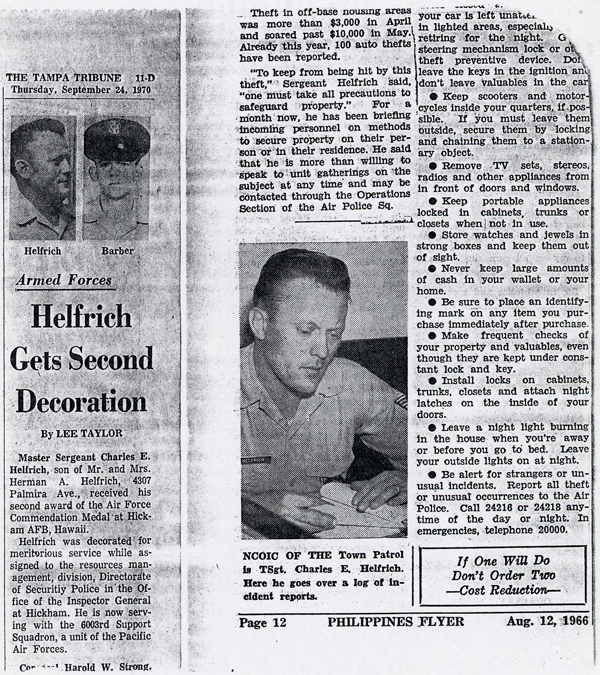 I enlisted in the U.S. Air Force the next day, June 26, 1950. 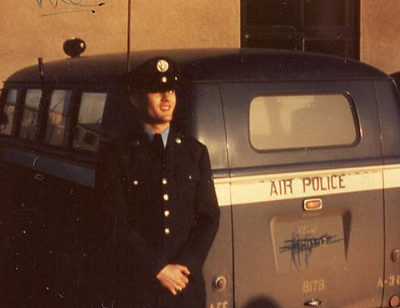 My military career in the air police field, began at Barksdale Air Force Base, in Bossier City, LA, and finished 20 years later at Hickam Air Force Base, Hawaii, in September 1970. 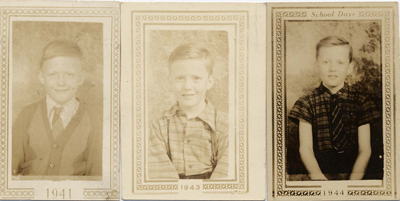 Here are two pictures of my brother and me below in 1953. I am on the left and Sonny is on the right. 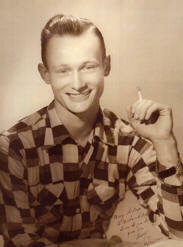 While stationed at Barksdale AFB, I met my wife, Jacqueline (Jackie) Josey, in Shreveport, LA, and we were married October 3, 1952. 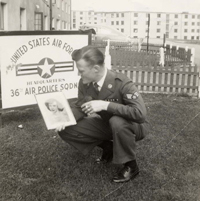 Here is a picture to the right at Bitburg AFB, Germany, where I am looking at a photo of Jackie while I am waiting for her and Bill to join me for a three year tour. 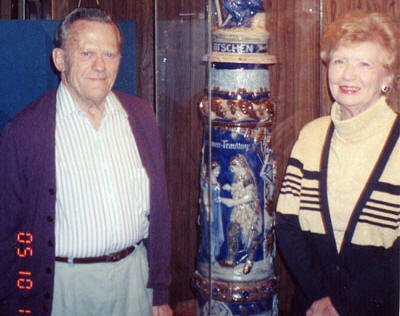 That marriage produced four sons and seven grandchildren. 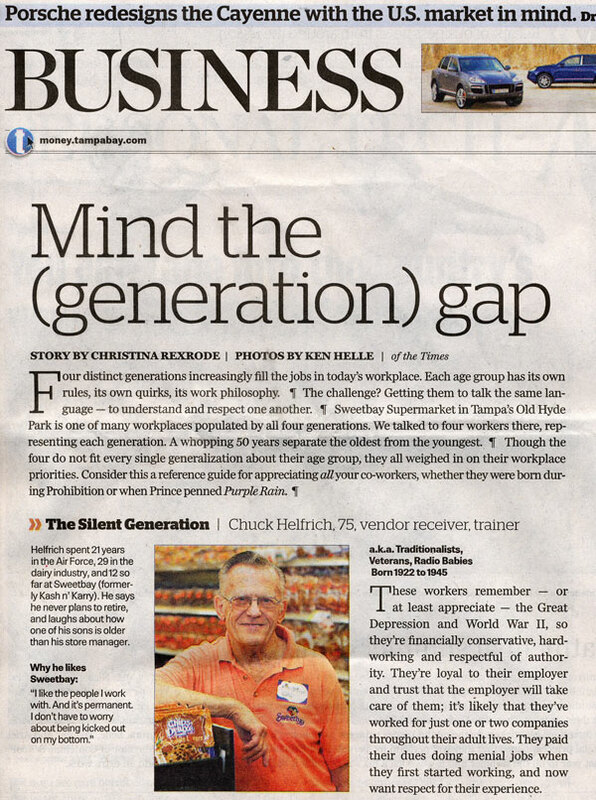 The family settled in Tampa, FL in 1970, where I pursued a second career at Sunnybrook Dairy and then later T. G. Lee Dairy, as Branch Manager in Winter Haven, FL. 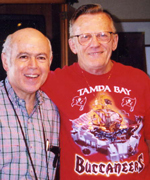 I then retired for a short period, and pursued a third career with Kash N Karry on Swann Avenue in Tampa, FL. 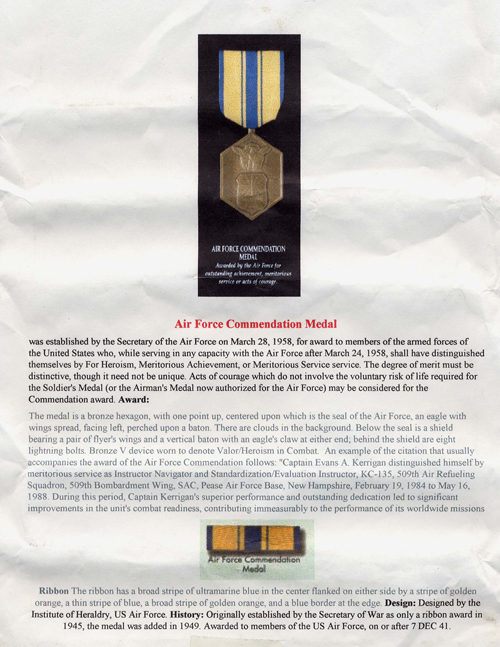 During this 20 year career, I was awarded the Air Force Commendation Medal on two different occasions, the first at Clark AFB in the Philippines, and the second at Hickam AFB in Hawaii. 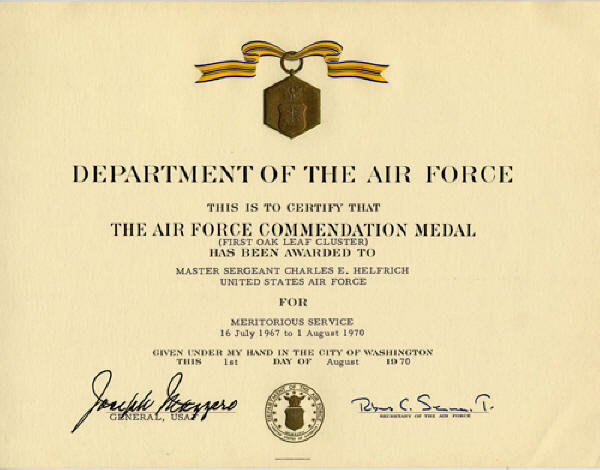 I was also awarded Air Policeman of the Month three different times and Air Policeman of the Year while stationed at Barksdale AFB. 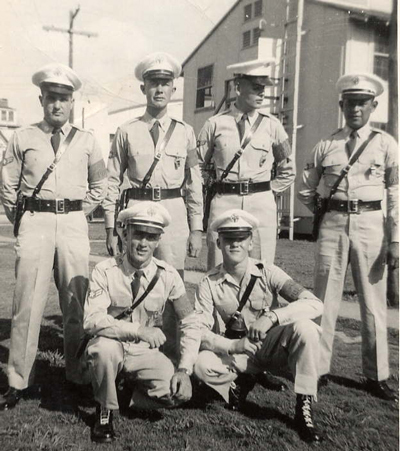 Among my most poignant memories and achievements in the air police field were when I served as flag bearer at numerous honor guard ceremonies, and memorial services. 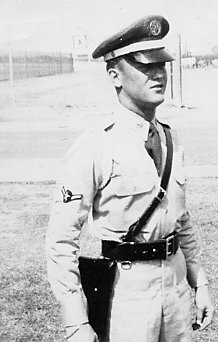 The first two years of my career, I was the bearer of the American flag and then was promoted and put in charge of the honor guard. 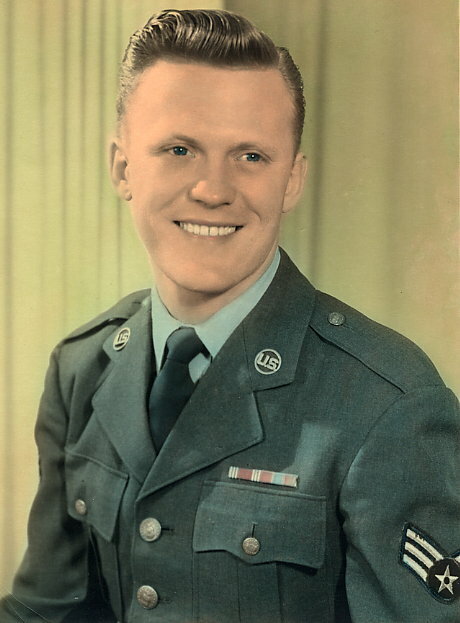 I remember the first time the flag that was on the casket was folded down to me; I did the last fold and then went over to present the flag to the widow of the airman who had been killed in Korea. It was something I will always remember; a very difficult time for me. I felt myself feeling sadder for the two little children about three and four years old, who would never know their dad. After about two years of that, I realized that I was becoming numb to it all and decided it was time to get out of it. It was quite an honor to be selected as NCOIC of the elite Air Police Precision Drill Team at Bitburg AFB, Germany. I found that to be exciting with the twirling, marching and throwing the rifles (with the bayonets) up in the air for exchanges with each other. We traveled and performed at many installations. That was a period of my life where I felt the adrenaline rush each time we stepped onto the show floor. 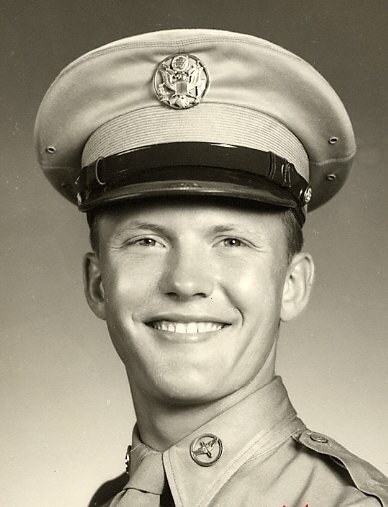 Please visit that page of photos, listed under the Helfrich-McCoy lines on the Main Index of Names page as "Helfrich, Charles Earnest - Precision Drill Team" or just click on this hyperlink. 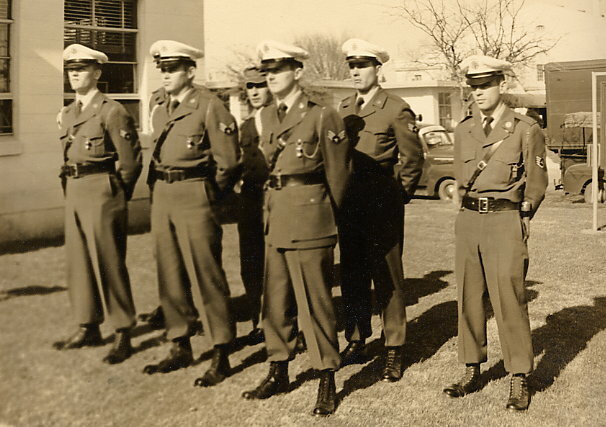 One particular memory that has stood out in my military career was the day when I was serving in the position of NCOIC of the honor guard at Whiteman AFB in Missouri. We were all waiting on the ramp for the arrival of General Humfeld, SAC Commander, and a big ceremony was planned. 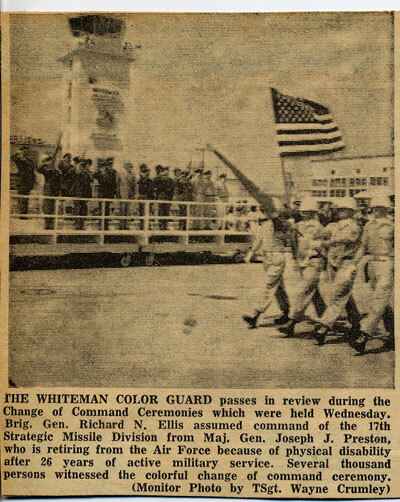 Then, the news came in that President Kennedy had just been assassinated, the general's plane was diverted, and all ceremonies had been cancelled. Everyone was glued to their television sets during the following days. We were all in shock. As a nation, that time seemed to mark the loss of our innocence. 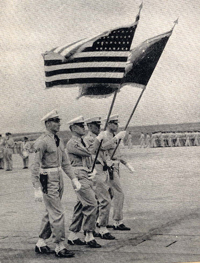 Here is one picture to the left of me - second from the left, carrying the American flag and another one on the right here with an "X" above my head. 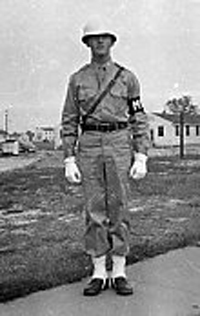 1955 - Click here (then a second lower right click) to see me with an "X" above me. 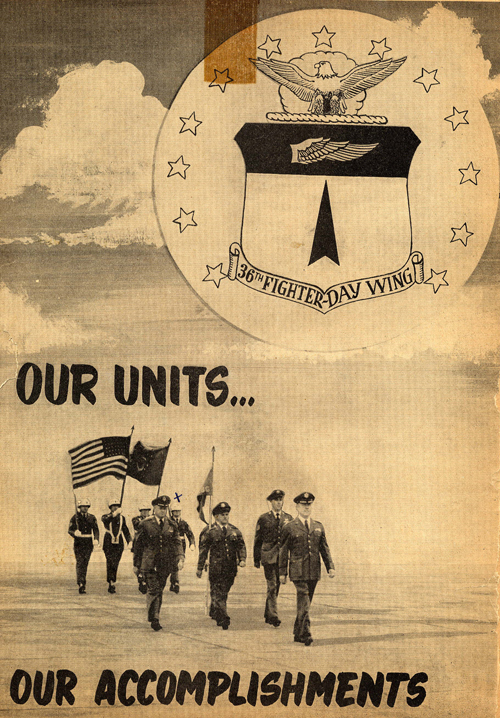 Tours of duty included Barksdale AFB, LA; Bolling AFB, Washington, DC; Bitburg AFB, Germany; Whiteman AFB, MO; K. I. Sawyer AFB, MI; Clark AFB, Philippines; and Hickam AFB, Hawaii. 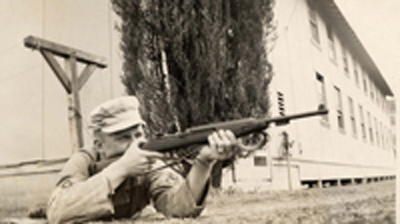 During the assignments at Whiteman AFB, and Hickam AFB, I was active in the Cub Scouts/Boy Scouts of America, serving as Cub Master at Whiteman AFB, and Assistant Scout Master/Committee Chairman in Hawaii. 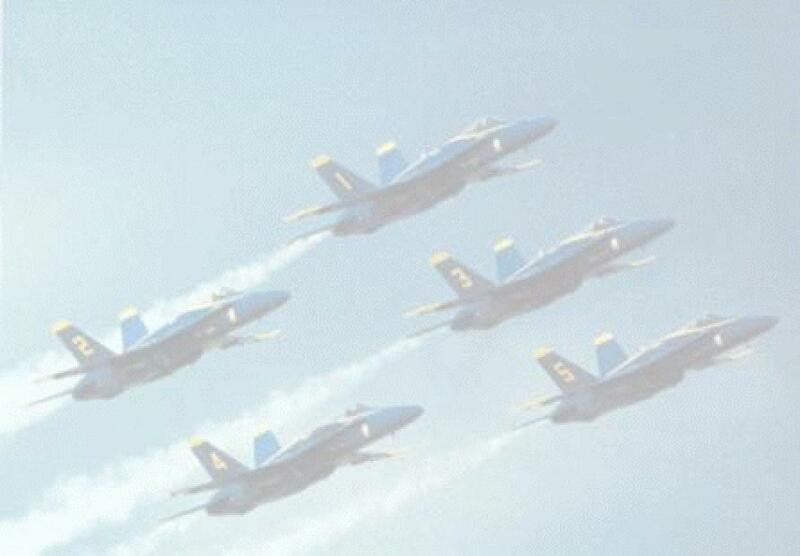 I was also active in the base chapel at Whiteman AFB as head usher for several years. 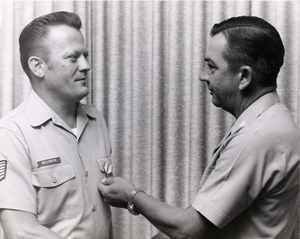 During my tenure at Clark AFB, I served as the NCOIC of the town patrol headquarters. 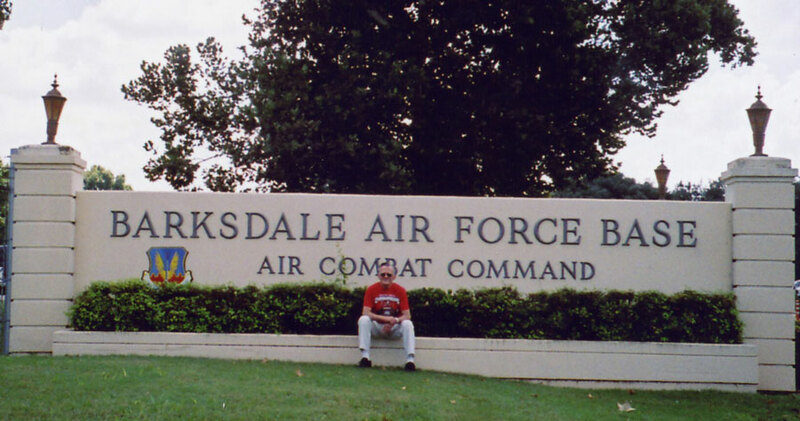 While stationed at Hickam AFB, I worked in Headquarters PACAF, Provost Marshall General’s Office as a Statistical Analyst. 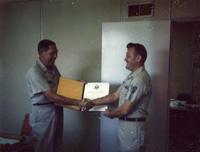 I came to MacDill AFB to retire in 1970, completing a 20 year career. Pittsburgh has a lot of good memories for me too, but it was many years - from 1950 until 1990 - before I went back, for my 40th class reunion. My, how Pittsburgh has changed and grown over the years. And, one of our classmates became a mayor of Pittsburgh later. 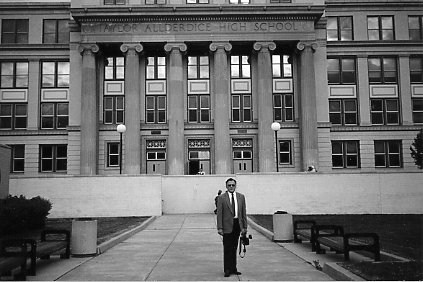 This is me in front of the school in 1990 (click to enlarge) at my first class reunion, which was the 40th one. The story about that is below. I had never been to a class reunion, prior to 1990. Jackie sneaked around and found out when the Taylor Allderdice 40th reunion was to be held in 1990. She just told me to ask for the weekend off from work, and that was all that I was told. I did not know where I was going until I got there. One of Jackie's big surprises. She used a great ruse to get me there, telling me we were going on a surprise trip way up North, but just stopping off in Pittsburgh, because she wanted to see where I grew up. She even got a sightseeing tour guide to take us on a tour of Pittsburgh. Can you believe that she actually had tracked down our school class president, Sam, (see the picture of him and me on the left here) and had him play the role of the tour guide? I did not recognize him after 40 years, and they used a bogus name for him. 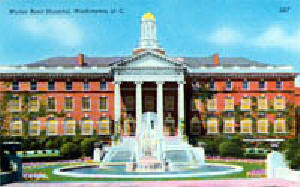 Then, Jackie said she would like to see the school that I went to, and Sam pulled off at that intersection. We just went up to take pictures, with my never knowing anything. People were coming in and out of the school, so we went in to take some more pictures, and went in to check out the gymnasium, only to see 1950 CLASS REUNION BANNERS!! I confess to being choked up and having to wipe away a couple of tears at that point. The surprise of my life. Jackie could not top that one. What a thrill seeing my classmates after 40 years. And, do they ever put on a production, with a program that is like a Broadway play for each and every reunion. Needless to say, we attended the 45th and 50th reunions also. 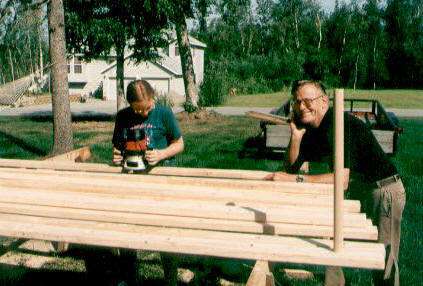 Another memorable time in my life was helping two of our beautiful granddaughters in Alaska put up a play station. What fun we had with it and here are the photos to prove it. Gosh, it seems as if it all happened yesterday. 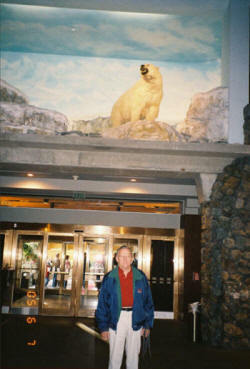 We have done many other exciting things over the past 50 years; several cruises, rafted down the Colorado Rapids and other rivers, toured New York and Niagara Falls, and Canada, inhaled the beauty of the magnificent cherry blossom trees, marveled at the sites in Washington, DC, took a nostalgic trip back to Hawaii to visit with Bill and Yumi, almost 40 years after we left our duty station there, toured through Branson, MO, traveled several times to see the fall colors, toured the entire state of Tennessee, attended many family reunions, toured Alaska five times, panned for gold, rafted down their icy cold river, flown up to the base of Mt. McKinley and landed on the Ruth Glacier (7,000 ft. above sea level) and built a snowman; absolutely breathtaking beauty. Believe me, Alaska is God's Country. Among all of those many memories, Jackie and I share the many, many times we have visited our ancestors in more cemeteries than we can count, and took pictures of their headstones and/or documented where they were buried, until we can get headstones for them if they did not have one. 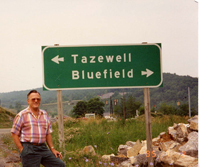 The picture to the right is one of the times (1995) when we went back to my roots and did some more researching in Tazewell, VA. And, the picture to the left is the home my mother grew up in, and where we spent our summers as children. It was fun stomping back through the area where I grew up. Life has been full for us. 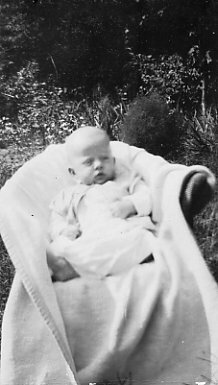 When I was born, Herbert C. Hoover was the President. Amelia Earhart became the first woman to fly solo across the Atlantic Ocean. The Tomb of the Unknown Soldier was dedicated in Arlington National Cemetery. Depression low point of Dow Jones Industrial Average: 41.22, unemployment hit 24%. Babe Ruth pointed to "the spot" and hit a home run in the World Series. Wages were down 60% from 1929. Bread was $0.07 compared to $1.14 today, a new home average price was $3,050, compared to today's $173,800. The population was 124.9 million compared to today's 294.2 million. Average income was $1,268 compared to today of $42,700, and gas was $0.18 compared to today's price of $3.00. It all seems so long ago. My, my, how things have changed, but then every generation can say the same thing. 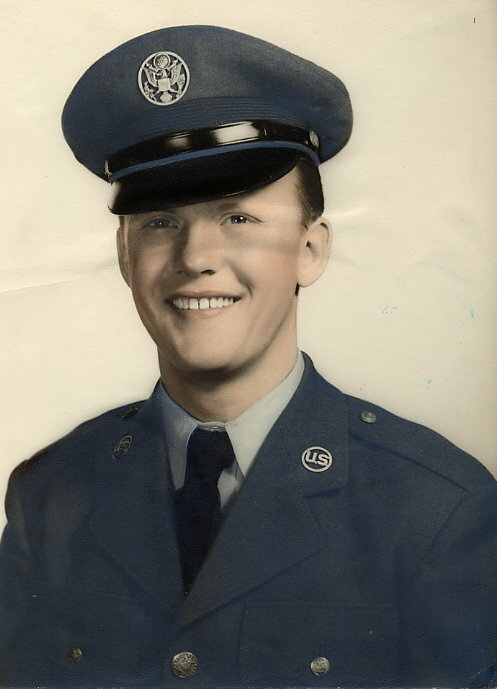 I have a wonderful family, my wife, Jackie, of 50 plus years, and four sons, Billy Charles, and his wife, Yumi, and their daughter, Amy, of Bealeton, Virginia; Lester Dean, and his wife, Janet, and their two daughters, Rebeka and Heather, of Palmer, Alaska; Ronald James, and his wife, Elise, and their daughter, Lauren, and son, Michael, of Tampa, Florida; Paul Wayne and his wife, Ellen, and their son, Daniel, and daughter, Julia, of Wesley Chapel, Florida; and one brother, Herman Larry (Sonny) Helfrich, of Front Royal, Virginia, one niece and four nephews..
Jackie had a birthstone gold nugget ring made for me and all four sons. October 7, 2007 - Chuck back at his first military base after boot camp. Jackie thought this might be a nice biography/pictorial treasure trove for our grandchildren, so I am humoring her and giving my consent to do this page any way she wants to, with my blessing. We do have a lot to be thankful for and we definitely feel blessed. Thank you for stopping by and I hope you will come back often, as this site is being worked on daily.